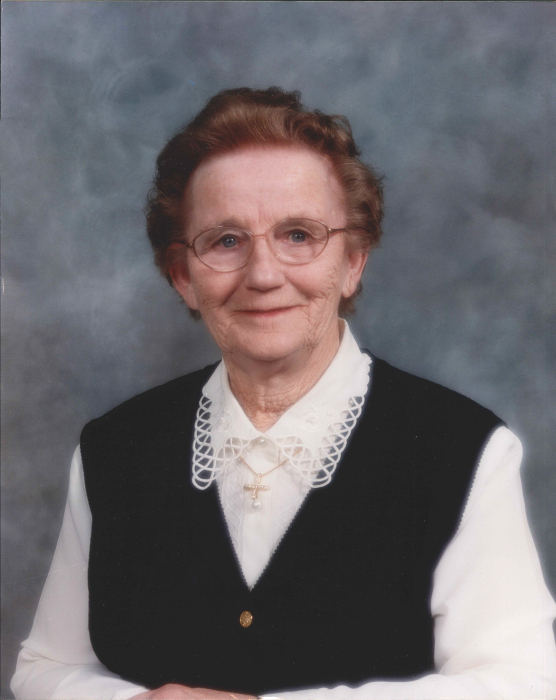 Irene Dorothea Kreutzer passed away peacefully on January 20th, 2019 at 97 years of age. She was predeceased by her parents, William Huber & Katherine Schmidt, who were born in Lutz, the Eastern part of Germany. She was also predeceased by her husband John W., grandson Merlin (son of Mary & Harold Kreutzer) and she was the 8th of 12 siblings, Annie, Betty, baby Johnnie, John, Albert, Ella, Jack, Margaret, Herbie, Ernie and Ruth. She is survived by her two sons, Harold (Mary) Kreutzer and Bernard (Donna) Kreutzer, her grandson Jamie (Jackey) Kreutzer, grand daughter Joy (Trevor) Klassen, her great grandchildren, Jeremy, Julia, Carley & Brady and many nieces and nephews who she loved dearly. She also had a special place in her heart for her Godchildren, Larry Huber, Wayne Preusentanz, Gerry Single, Catherine Watson, Donna Smith, Grace Smith, and Ken Oswald. Irene was born on December 31st, 1921 in Glenella MB, almost a new years baby. She was baptized 3 weeks later on Jan 22nd, confirmed on Nov 15th, 1936 and was brought up in the Lutheran Church. When Irene was 5 years old her family moved to Lipton SK where her father was offered a job raising cattle near his family. Two years later they moved to McDonald Hills outside of Dysart, SK to try a hand at farming. With a blind mother and all those children to feed, times were more than tough for Irene and her family. They moved several times and often lived in a 2 room shack with sugar sacks as pillows and walls lined with mud. Irene started school at age 7 and at 13 she had to quit after only completing grade 5 to help her blind Mother look after the younger children. Even blind though, her Mom taught the girls how to sew, cook and clean while her Dad worked hard in the fields. A couple years later Irene started her first job, working for one of her neighbours, the Taylors, by running a household for $5 - $8 a month. Baking bread, cleaning house and caring for three children Irene had a full time job and continued to work hard all of her life. At 19 years old, Irene headed to Toronto to live with her sister Annie but only made it to Stonewall, MB after her sister became ill. She made her way back to Glenella and a couple years later she married John William Kreutzer (born on Jan 8, 1912) on November 25th, 1942. They were married in Zion Lutheran church and started their family life on the farm in the Tupper district near Plumas. John W. paid $450 for the family farm with money earned by selling furs of weasels and coyotes. Harold was their first born on June 26th, 1943 and Bernard arrived three years later on July 31st, 1946. Even though life was hard, Irene and John loved farm life and it was a dream to have their boys raise their families on the same yard with them. Times were not always easy. They had no car for the first five years of their marriage. So building their house was difficult with only a bicycle as a mode of transportation. Their first tractor was bought in 1949 and they welcomed hydro in 1951. Irene worked in the fields, the yard and chore time along side John. Every building was painted and every farm animal was cared for. Irene made sure of it. By the 1950’s, times started to become a bit easier and Irene’s siblings were able to travel to visit. It was an exciting time when Irene’s family came from Sask and she would even wait at the end of the road for them. She would get a “Huber shine” on and they would stay up to the wee hours of the morning laughing and visiting and laughing some more. After her husband John W passed away from cancer in 1978, Irene moved from the farm to Plumas where she lived for the next 35 years. She really loved being known as Gram not just to her family but our friends too. Merlin was her first grandchild and he is the reason why we call her Gram. She loved him with all of her heart and was never the same when he passed away from a tragic car accident on March 5th, 1981. She loved all of us and would go on about each one of us, like how smart the great grandchildren are, how funny Jamie is and how she loved her girls, Donna & Mary. They worked many hours together, canning, butchering chickens, hauling water and feeding the animals. Harold was always there for Gram and would do anything for her. She was always after him to retire but he continues to farm full tilt. Irene loved to stay active by playing cards, bingo and won several bowling trophies. Many happy hours were spent on the lake fishing with Bernard & Jamie and her brothers Jack & Ernie. She even caught 11 pickerel her first time on the boat. When she turned 90, we celebrated her birthday at Eddies in Glenella back where it all began. Soon after, she moved to Country Meadows where she resided for the last 5 years of her life and was well taken care of. She always had lots of company and continued to be Gram to us all. Now she has gone home to the Lord and her heart was prepared for it. Just like Gram, may you also know the peace of God that transcends all understanding. May it guard your heart and mind and give you peace. We love you and miss you already Gram. May you rest in peace.